Urban Regeneration in London shares many features with British colonialism. 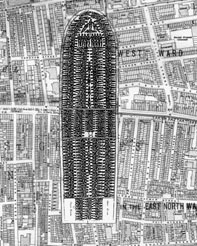 The Olympic site of East London was described as "empty", just as parts of Africa were 150 years ago. The forces of urban regeneration more often displace local populations rather than improve their conditions. Myths of "trickle down" as used in the 1980s in Docklands and the updated version called "mixed tenure" are instruments to paint gentrification and the privatisation of public land as benefiting the local populations. Referring to videos produced by both Despite TV (83-93) and Spectacle (92-present), Mark Saunders will present an irreverent look at the last 25 years of urban development.